Barcelona: What is going wrong for the La Liga giants? On 16 March, goals from Luis Suarez, Neymar and Lionel Messi eased Barcelona to a 3-1 Champions League victory over Arsenal, completing a straightforward 5-1 aggregate win and sending the holders into the last eight. Match of the Day presenter Gary Lineker, a former Camp Nou striker, was moved to tweet: "The football that Barca play is utterly joyous. The best team to watch in the history of the beautiful game." His gushing sentiments were widely shared. The win over Arsenal was Barca's 38th consecutive game without defeat, they held a seemingly unassailable lead over Atletico and Real Madrid at the top of La Liga and had advanced to a Copa del Rey final meeting with Sevilla. As the season entered its final straight, a back-to-back league, cup and European treble was looking distinctly likely. Fast forward one month, and the picture has changed - dramatically. Since the start of April, the Catalan giants have been knocked out of the Champions League, lost three straight league games for the first time in 13 years and seen their nine-point advantage in La Liga whittled down to nothing. Suddenly "the best team to watch in the history of the beautiful game" cannot seem to win a match and have been plunged into a dramatic crisis which could see their season finish without a trophy. What on earth is going on? Just a case of bad luck? According to manager Luis Enrique, his team's downturn is a simple case of bad luck. That, at least, was his explanation for their latest setback, Sunday's 2-1 home defeat by Valencia, when he claimed he was happy with the performance and that "we only lacked the necessary fortune to win the game". The local media agreed, with newspaper Mundo Deportivo's front page on Monday featuring a headline which lamented: "1-2. How unfair!" It is true that Barca created plenty of chances to claim three points: Suarez headed over from close range, Gerard Pique dragged a golden chance wide and visiting keeper Diego Alves made excellent saves from Messi (twice), Ivan Rakitic and Neymar. In addition, Valencia's opener was a freak own goal as Rakitic deflected a cross into the net. Similarly, Barca's other recent defeats have contained moments of ill fortune. In the home defeat by Real Madrid that started the rot, for example, Barca flew out of the blocks and should have taken the lead when Suarez inexplicably mis-kicked in front of an open goal. Bad finishing rather than bad luck, true, but the outcome may have been very different if he had scored. And in stoppage time at the end of their decisive Champions League defeat by Atletico Madrid, Barca were denied a penalty when home captain Gabi blocked Andres Iniesta's goalbound shot with his arm clearly inside the area, only for referee Nicola Rizzoli to judge wrongly that the offence had taken place outside the box. So things have gone against them - but they have benefited from the rub of the green too. Gareth Bale had a goal disallowed harshly in the Clasico defeat, while Iniesta was lucky to avoid a red card for a deliberate handball at Atletico. 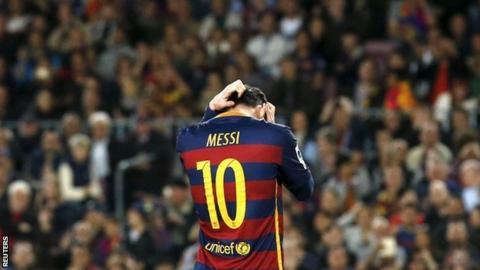 Bad luck, then, is not the only answer to Barca's malaise. So what is? The key to Barca's success over the past 18 months has been their sensational strike force of Messi, Suarez and Neymar, often known as 'MSN', who combined for a record 122 goals last season and have reached treble figures again this time around. Just as MSN's success was central to their team's long unbeaten run, the current slump is explained largely by a sudden and sharp downturn in the front three's effectiveness. During five games in March, they scored 13 goals between them, with Messi grabbing seven, Suarez two and Neymar four. But they have only netted three between them in their past five outings - one from Messi, two from Suarez and none from Neymar. It is not just about the lack of goals. The front three, who have worked so well together over the past 18 months, appear to have lost the near-telepathy which made them almost impossible to stop. During the Champions League quarter-final second leg defeat against Atletico, for instance, Messi did not complete a single pass to Suarez over the entire 90 minutes and made only one to Neymar; in the previous round's home win over Arsenal, by contrast, Messi completed three passes to Suarez and no fewer than 13 to Neymar. Something has gone very wrong with the collective dynamic between these three spectacular players. The great mystery is what. Fatigue is the explanation offered most commonly for Barca's struggles as they head into the final stages of a demanding season, which started earlier than other clubs because of their involvement in the Spanish and Uefa Super Cups. With December's Fifa Club World Cup in Japan adding to the workload, Sunday's defeat by Valencia was their 56th match of the season. In Europe's big five leagues, only Athletic Bilbao have played more games. By comparison, Champions League semi-finalists Manchester City have played 52, and Bayern Munich 45. It is perhaps not coincidental that the Clasico defeat by Real Madrid, which began Barca's slump, followed an international break that had seen six of their starting XI - including the three superstar forwards - embark upon transatlantic flights to and from South America. They certainly looked jaded during that defeat against Real and in the second leg of the Champions League exit to Atletico, but there were no visible signs of tiredness during Sunday's loss to Valencia, when they kept on running hard until the last seconds. And it is certainly not advisable to try telling manager Enrique that his team are tired. In his news conference after Sunday's match, journalist Victor Malo asked whether the physical aspect was an element in his team's problems. The Barca boss replied by asking the journalist for his surname, knowing full well that the answer was 'Malo', the Spanish word for 'bad'. "Correct," sniffed Enrique. "Next question." Enrique certainly has not caused his team's collapse with any tactical tinkering, because they have played in exactly the same manner and with the same personnel during their four recent defeats as they did during their six-month unbeaten run. If one slight change can be identified, it is that Messi is occupying a more central position, allowing opposing defences to focus their attentions in the middle rather than forcing them to stretch across the full width of the pitch, as they have to do when Messi is positioned on the right wing. But that is only a minor variation and does not explain why the front three have stopped combining so well or so regularly - which is, ultimately, the greatest dilemma for Enrique to solve. If he can get MSN firing again, the team will start scoring and winning again. One major criticism aimed at Enrique is the lack of squad depth, which leaves the manager without viable options in reserve. During Sunday's game against Valencia, for example, Enrique did not make any substitutions at all, clearly not believing that anybody on the bench could have made a positive impact. Although his hand was weakened by the absence of injured attacking midfielder Rafinha and the out-of-form Arda Turan through suspension, it has left Enrique open to the accusation that his team is too one-dimensional. The Madrid media has latched onto that line of thinking, with Marca accusing Enrique of being a 'ghost' on the touchline for his failure to make substitutions or tactical changes against Valencia. The paper also suggested that his team's collapse makes him resemble former Manchester United assistant Carlos Queiroz during his ill-fated stint in charge of Real Madrid in 2003-04. Of course, the easy retort is that Enrique doesn't have a 'Plan B' because when his 'Plan A' of MSN is functioning, nothing else is needed. But with the trio's loss of form, Barca do not appear to have any other way of winning. There is no time for Enrique and his players to sit around feeling sorry for themselves, because the first of their five remaining La Liga games takes place on Wednesday with a journey to Deportivo La Coruna. The fixture list would appear to favour Barca, with all their upcoming opponents currently in the bottom half of the table. Atletico, meanwhile, face a testing trip to fifth-placed Athletic Bilbao on Wednesday and will have to do without the services of their suspended captain Gabi. Real Madrid also face a tricky midweek fixture with the visit of Villarreal, who are pushing hard to secure fourth place and have a Europa League semi-final with Liverpool to look forward to. In their current form, Barca will find it anything but easy to win their game against Deportivo, who have been La Liga's draw specialists this season. No fewer than 17 of their 33 games have ended in stalemate, including a 2-2 draw at Camp Nou in December. Worrying about their title rivals will do little good. Barca's season will be decided by whether they can return to their pre-April form. If they do, they should win all five games and be crowned champions. At the moment, however, that is a very big 'if'.